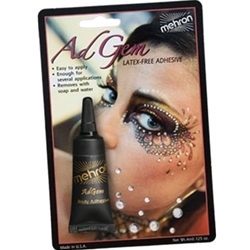 The AdGem gem adhesive is a latex-free adhesive that is designed for body decorations. It can be used to apply glitters, jewels, and other cosmetic accessories. AdGem is a liquid when dispensed from the tube but quickly changes to a rubber-like consistency when exposed to the air. Package includes 0.125 oz. of AdGem adhesive and 12 small, clear rhinestone gems.